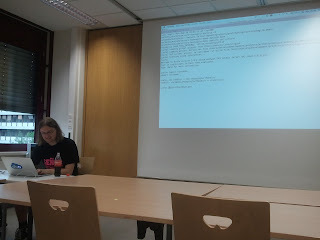 Last Monday we did our September meetup at one of Bonn University's buildings. Many thanks to Lukas Pustina for setting us up with the new venue! Even though it is a bit removed from stuff like bars and shops, I think it could be a nice locale for any meetups where we need to have a lot of table-space for laptops, like code-retreats and dojos. This time around, Daniel Westheide (twitter, homepage) joined in to talk about CQRS and Event Sourcing. It's an extremely interesting pattern that I think a lot of teams should consider, instead of overusing the classic CRUD/DAO model everywhere. Big thanks to Daniel for doing this presentation!